I thrive on holdouts. And this website is slowly becoming a tribute site to many of them, a commemorative site for legendary businesses both present and past. As time passes, I am accumulating a growing number of postings on places no longer with us - tombstones in the graveyard of NYC. Billy's Antiques is one of those places. What kind of place? The kind that is the rasin d'etre to be here in the first place and that you won't find anywhere else. The kind you expect to read about on this website and visit in person. Billy Leroy is as iconoclastic as the business itself. Growing up on the Upper East Side, he attended boarding schools and studied at the Art Institute of Boston. 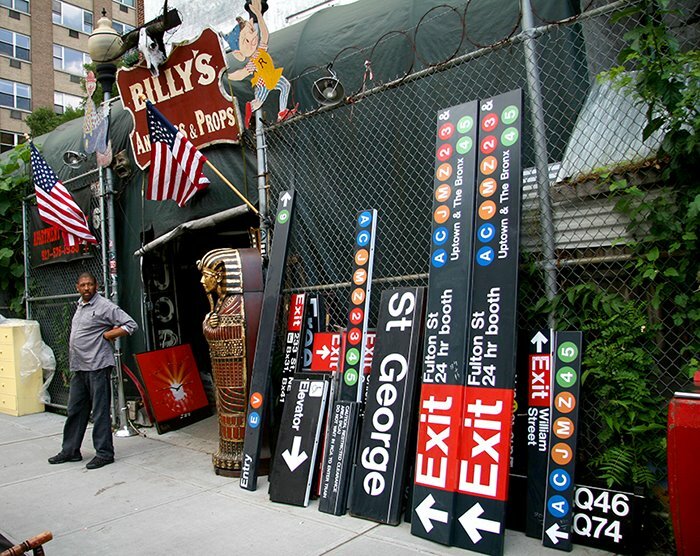 Here, at Billy's Antiques and Props you can find all manner of things - meteorites, subway signs, furniture, paintings etc. It's a place the New York Times referred to as a "green circuslike tent whose lineage seems equal parts flea market, carnival midway and antiques shop." "The strange green tent that has been at 76 East Houston Street since 1986 is the last eclectic antique and prop store on the Bowery. Billy’s first incarnation was called Lot 76.In those days the Bowery was like the Wild West. Only the adventurous came downtown. As the sun would set on East Houston the junkies and alcoholics would lurk around like Zombies, asking for handouts. The creator of lot 76 was Rob Fennick a forward thinking antique dealer from Detroit. The tent has provided countless objects to thousands of New Yorkers. All walks of life have passed through the doors: movie stars, rock stars, artists, junkies, hookers, gangsters entrepreneurs, hipsters, and today there is a new breed on the Bowery; the metro-suburbanites. But the spirit of old New York is still alive at Billy's, a good deal at a fair price. All the people involved in the operation of Billy's have been down the boulevard of broken dreams and take their jobs seriously. We treat people the way they treat us. Ask a silly question get a silly answer. We at Billy's want to thank our customers for keeping this tradition alive." Also wanted dead or alive: Space Surplus Metals, CBGB, Gotta Go, The Bitter End, Bowery Poetry Club, Kristal Palace, Claremont, Hurry, Canal Rubber.